A consortium including Tata Steel, Lawrence David, SDC Trailers and Cambridge University, have produced a prototype rigid-body trailer that reduces total unladen weight by 2.5 tonnes. The Lightweight Aerodynamic Double-Deck Trailer Trial is the result of an Innovate UK-funded project, which aims to reduce the carbon footprint of trucks, both while out on the road and through the whole life cycle. The vehicle’s remarkable lightness has been achieved by comprehensive use of Tata Steel’s Coretinium® steel composite sheet, as well as chassis engineering by SDC Trailers, body design by Lawrence David and aerodynamics by Cambridge University. The result is a vehicle weighing just 8.6 tonnes – 22% lighter than a conventional vehicle – and the ability to carry a larger payload per journey. 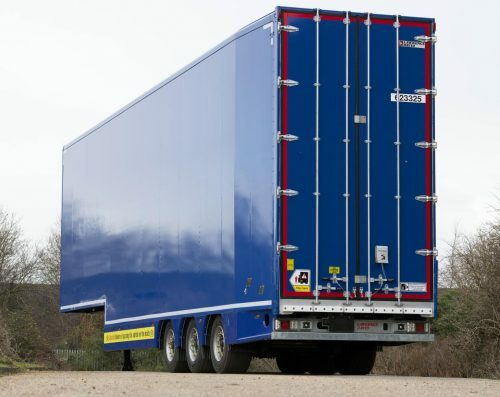 It also has a higher proportion of recyclable content than conventional rigid-body trailers. Tata Steel’s Coretinium sandwiches a polypropylene honeycomb core between two steel skins to produce a lightweight but highly durable, recyclable composite panel. Weighing approximately half of an equivalent timber panel, Coretinium has been used in the prototype trailer’s side walls, front bulk head, rear doors, trailer flooring and second deck base. Coretinium is produced at Tata Steel’s Shotton Plant in North Wales, offering a local supply chain for UK-based trailer manufacturers such as Lawrence David. Eight vehicles have been produced for the Lightweight Aerodynamic Double-Deck Trailer Trial, four of which will feature Tata Steel’s Coretinium. The trial will see the rigid-bodied trucks join the fleet of a major British supermarket, where their benefits will be tested in real world conditions.